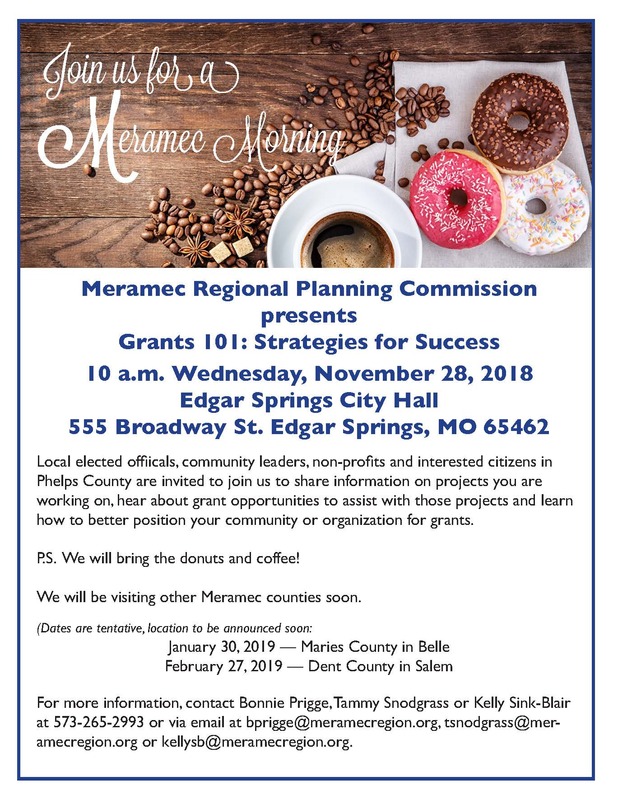 EDGAR SPRINGS­—Meramec Regional Planning Commission (MRPC) will launch its second series of Meramec Morning gatherings at 10 a.m. Nov. 28 at the Edgar Springs City Hall, 555 Broadway St. in Edgar Springs. This round of county-level gatherings will be entitled “Grants 101: Strategies for Success.” Local elected officials, community leaders, non-profits and interested citizens are invited to attend to learn the basics of grant preparation and to discuss specific projects local leaders may be pursuing. MRPC will be hosting a Meramec Morning in every Meramec county, starting in November and running through July 2019. Below is a list of tentative dates with locations to be announced soon. For more information on Meramec Mornings, contact Prigge or Assistant Director Tammy Snodgrass at 573-265-2993 or via email at bprigge@meramecregion.org or tsnodgrass@meramecregion.org. Formed in 1969, MRPC is a voluntary council of governments serving Crawford, Dent, Gasconade, Maries, Osage, Phelps, Pulaski and Washington counties and their respective cities. Washington County Presiding Commissioner Marvin Wright serves as chairman to the board. A professional staff of 25 offers technical assistance and services, such as grant preparation and administration, housing assistance, transportation planning, environmental planning, ordinance codification, business loans and other services to member communities.